Select energy sources and energy converters to build energy chains to power appliances and vehicles. Examine how each energy converter in a chain loses some energy and reduces the energy available for use. For example, show that using a solar panel and an electric motor to drive a car delivers only 16% of the original energy in the sunlight. This learning object is one in a series of five learning objects that progressively increase in complexity. Students arrange energy converters into a logical chain to operate appliances or propel vehicles. Students monitor the efficiency of converters in an energy chain. Describes the function of a variety of energy converters. Requires students to place energy converters into logical sequences so that the energy of different sources is used to operate a radio or propel vehicles. 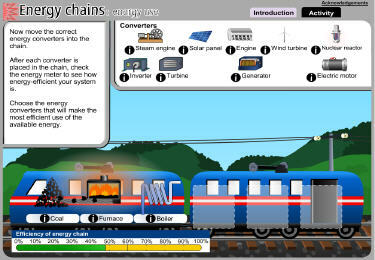 Uses a meter to show the percentage of original energy remaining after each stage of the chain. Provides feedback about the feasibility of energy chains. Asks students to review the energy chains constructed. Includes options to save and print the energy chains constructed.